I love bibimbap. "Mixed rice" is what it means, and the possibilities are endless. 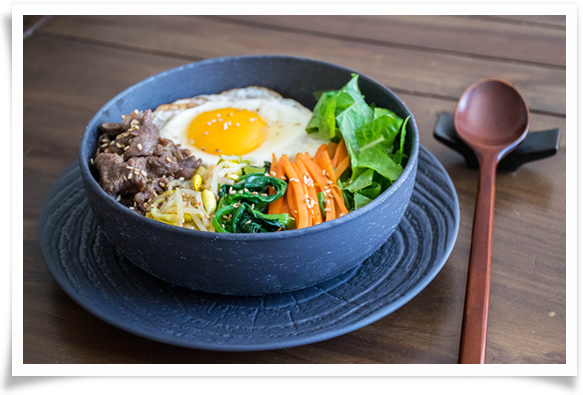 I've blogged about vegetarian bibimbap here, but if you are in the mood for a little more protein, bulgogi is what you can add to round out the dish. Bulgogi is thinly sliced beef cooked in say sauce based marinade, and not only is it easy to make, it is also an affordable meat option. I remember when I was little, my mom would make kal-bi (short ribs) on special occasions, but bulgogi would be on our weekday dinner table and even in my lunchbox the next day. Traditionally, sweetness was enhanced by adding ground up fruit such as Asian pear or apple, but if you don't have any, no worries, it will still be delicious. You can find sliced beef packaged as bulgogi meat at Korean supermarkets, but any thinly sliced beef would be fine. First, place the meat in a bowl. Second, mix everything else together to make the marinade. Next, add the marinade into the meat and mix it well together. Let it sit for 30 minutes to an hour. Keep in mind you can pick any vegetable toppings you like, such as sauteed mushroom or squash. You can be really creative by using kale, radish, tofu... I told you the possibilities are endless! Gochujang sauce for bibimbap is sold at Korean markets, and I recommend it if you eat bibimbap often. If you don't have it, you can make your own sauce by mixing 4 tablespoons of gochujang, 2 tablespoons of sugar, 1 tablespoon of sesame oil, and 1 tablespoon of vinegar. After 30 minutes to an hour of marinating, cook bulgogi in a well heated frying pan. Don't forget to cook the egg! I love sunny side up egg with crispy edges. Put everything together, and mix with gochujang sauce as well as a drizzle of sesame oil. You can also add a sprinkle of sesame seeds. Time to dig in... enjoy!